I first started work with Neil towards the end of 2013. I had impulsively entered a 50-mile ultramarathon and figured I needed help as I didn't know anyone who had attempted one before. It seems a long time ago now but the result was, through Neil's coaching, a successful completion of the race. Fast-forward to summer 2015 and I reached out to Neil as I had yet again, impulsively entered another event. 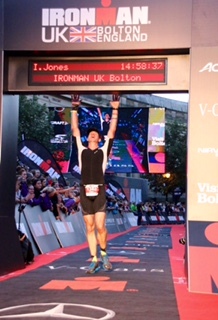 This time it was the 2016 UK Ironman. After an initial discussion, Neil instilled the confidence that achieving my goal of merely completing the race within the 17 hour cut-off was achievable and he set out with designing a plan very specific for me. I have my daughter 50% of the time so can't stick to the prescriptive "long bike ride every Sunday" that most advise. The training plan took into account when I did and did not have my daughter and used this to factor in appropriate rest days. This made the rigorous training achievable without necessarily impacting my day-to-day life. What Neil offers though is more that just a training plan. The experience he has, both with working with athletes significantly better than myself and being a competitor himself means the advice he has is invaluable. I lost count, as I'm sure he did, the number of times I sent out an SOS after a poor swim session and every time Neil listened and put a positive view on the situation helping to keep momentum. I must admit there were times when I called Neil a <enter expletive here>. Some of the training sessions he set out were tough and he was very good at holding me to account if my training was becoming complacent but there is one single reason for this, he wanted me to succeed. If asked, I wouldn't advise someone to use Neil as their coach, I would insist they have to.